If you are experiencing an issue with the sewer system at your home, place of business, or a building that you own then there are basically two choices regarding the repair methods that plumbing contractors will use to fix the problem. Please read the following information in order to determine which one is the best for your situation. Traditional sewer line repair, also know as trenching, is a process that is as old as the day is long. The plumber must take many steps that certainly take a long time. The exact location of the problem must be located and then verified. There may be many obstacles near or around the sewer pipeline that could get in the way such as power lines, trees, sidewalks, and statues to name a few. The process begins when the plumber goes to the property in order to conduct an initial assessment using a video camera inspection on the inside of the sewer pipeline. They will then survey the exterior area that surrounds the pipeline. After contacting the local utility companies they will mark off any underground electric lines, cable lines, and gas pipes. That way they will avoid breaking them during the excavation process. The plumber will then check with their materials supplier to see if they have the correct replacement parts in stock. Of course, they will need to place in order if the parts are not in stock, which delays the process. Over the next five to fifteen days, give or take the plumber will excavate a trench in order to expose the broken area of the sewer line, make the necessary repairs, and fill the giant hole back in with dirt. At that point, additional contractors will begin to put the landscaping and hardscaping back together. Since there are so many factors involved it is extremely difficult to project exactly when the sewer and plumbing systems will be back online. Trenchless sewer line repair is a relatively new process that was invented approximately twenty years ago. It incorporates the use of advanced technology instead of large excavation machinery. 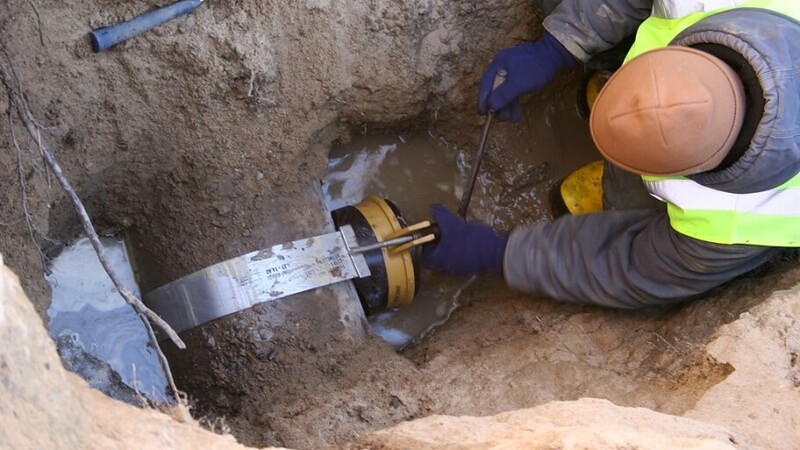 Nu Flow Technologies has been specializing in trenchless sewer repair since 1998. Our process begins the same way as the traditional method. A team of highly skilled plumbing technicians will arrive on site and assess the damage through the use of a video camera inspection. They will then either use an existing access point into the sewer system or create one. With trenchless sewer repair, there is no need to dig a trench. An inflatable tube is inserted into the sewer pipeline through the small access point. The tube is saturated in an epoxy resin formulation. The tube is then inflated, which of course allows the epoxy resin to coat the interior surfaces of the existing sewer pipes. Once the epoxy resin cures in place it forms a hard sleeve or lining if you will. The new lining is actually a pipe within a pipe. The sewage will now technically flow through the new pipe instead of the old, broken one. In essence, trenchless sewer repair instantly fixes the problem. Typically speaking, the entire procedure only takes one or two days to fully complete. This certainly makes trenchless sewer repair in Tulsa, Oklahoma the fastest way to have your sewer fixed in an emergency. As an added bonus, it is approximately half the price of the traditional excavation method. Please contact Nu Flow Technologies for a free sewer repair estimate.